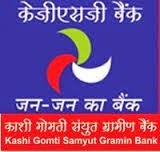 Kashi Gomti Gramin Bank Office Assistant Recruitment 2015: The Kashi Gomti Gramin Bank invites the online application from India citizens. These posts about the Kashi Gomti Sumyut Gramin Bank (KGSB) officer and office Assistant recruitment 2015. This Bank is sponsored by the Union Bank of India. Now the eligible candidate apply online at the official bank website. We have published the detail notification of the Kashi Gomti Gramin Bank Recruitment 2015.These recruitment of online application starts from 21.04.2015 and closing date of the online application on 06.05.2015.The application fees for the SC/ST/PWD candidates Rs 20 and other general candidates Rs 100 for the officer and office assistant post. Note: Eligibility criteria as per the RRBs CWE-III the advertisement will publish in the Employment news available on June 28 to July 4th, 2014. It has posted on the IBPS website. The selection procedure is based on the written test conducted by RRBS CWE III conducted by IBPS in September and October 2014 and personal interview. The merit list of the candidates for final selection based upon on Total Weighted Scores (TWS). The general candidates should pay Rs 100/- and SC/ST/PWD candidate application fee Rs 20/-.